I caught up with Joe yesterday by phone. He had to park the RV before he could chit-chat. He was just as funny as I expected. Anyone who can sell the idea of working professionally in parking lots eating barbecue has to have a good funny bone. But, hey, it worked. I've gotta give him credit. Very few people get a job doing exactly what they enjoy most. 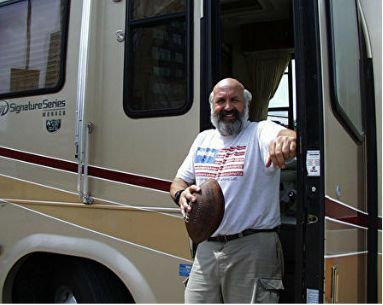 If you want to read about Joe Cahn and his life as the Commissioner of Tailgating, then see my article at Garden & Hearth.